The back supports the head and the upper part of the body. It is a complex network of bones, muscles, ligaments and tendons. The bony part of the back is known as the spine, and this is made up of bones known as vertebrae. The vertebrae are connected to each other by ligaments, and connected to the muscles of the back by tendons. The vertebrae are separated by discs, which are made up of a gel surrounded by a fibrous capsule. These make the spine flexible and act as shock absorbers. Each of the vertebrae has a hole in the centre, creating the spinal canal. This protects the spinal cord, which runs from the brain and down through the spine. Pairs of spinal nerves run from the spinal cord, through holes in the vertebrae called foramens, into the body. There are three main types of muscles in the back – the extensor muscles, the flexor muscles and the oblique muscles. 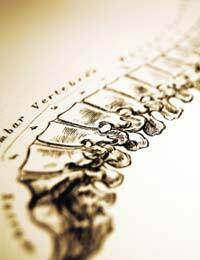 The spine or vertebral column is made up of 33 vertebrae. 5 sacral vertebra that are fused together to make the sacrum in the lower spine – these are numbered S1 to S5. 4 vertebrae that are fused together to make the coccyx or tailbone. The spine has four curves in it, and overall makes a gentle S shape. The vertebral column is about 72 cm long in men and 61 cm long in women (depending on height). The spinal cord is about 45 cm long in men and 43 cm long in women. There are about a billion neurons in the spinal cord, and it weighs about 35g. There are 31 pairs of spinal nerves running from the spine to the body. According to the Centre for Health Economics, 50-80% of people in the UK will have back pain at some time in their lives, and about 90% of cases of back pain improve within six weeks. According to a study published in the British Medical Journal in 2008, back pain is an expensive health problem in the UK. Back pain causes production losses in the UK of over £3000 million per year. Non-specific back pain causes up to five million lost working days per year. The overall cost of back pain in the UK (including the NHS, business and the economy) is about £5 billion per year. A study carried out by the Work Foundation showed that musculoskeletal disorders, including back pain, neck pain and RSI-type conditions, made up 49% of absences from work and 60% of permanent work incapacity in the European Union. This costs up to €240 billion a year. Ergonomic Chairs: Do They Help Back Pain?